This is a plate of “Educated Potatoes”. I am being free with the translation. The Japanese is 大学芋, Daigaku Imo. The first two characters mean “big” and “learning” therefore “college/university”. The last character means “potato’. As you look at the picture you will see this is not your normal plate of fries. They are not deep fried and they are candied. They are not your normal white potatoes but sweet potatoes covered in a syrup with sesame seeds. This plate came hot and sticky. I will let みきママ,　Miki Mama show you one way to cook them. Notice the long chopsticks used in cooking. You can also hear that paper towels are called “kitchen paper”. I think it comes from their use in cooking. The amber liquid used is honey in making the syrup if you are wondering. At the top of the video screen is ヒンヤリ, hinyari and カリカリ, karikari. This means chilled and crisp. The kids are sure cute at the end of the video. Do you wake up some mornings knowing that you have to have cooked carrots that day? When that happens, one must act. Drag out a pot and a tightly-fitting lid. While the pot preheats on the stovetop at low heat, trim the bacon. This bacon is made with no sugar: it is smoked, but not cured. I asked the local butcher; before too long he had a nice supply in his meat case. We like it for the flavor, because it is the flavor of the bacon, not breakfast cereal, and for the fact that it never leaves burned sugar in the bottom of a pan. They are all 10-inch boning knives, but each is different. Cooking is like anything else, in that you try out different tools, methods, and effects, to discover that you have preferences. Here the top knife has a stout, thick blade; a big handle, clunky for me but comfortable for a man; and that big stop going down from the forward edge of the handle. That one is perfect for removing a hide, disjointing a carcass, or deboning a large roast. That is wonderful, but not what we seek this day. The bottom one is excessively recurved. The carbon-steel blade has been sharpened so much that it has become shorter, back-to-cutting edge. The ratio of that height dimension to blade length is off-target for use in my hands. Were I six inches taller, my arm would be more straight as I stood at my workspace, and so I could wield the thing properly. But I’m not, so I just lend it out to the taller cooks, and otherwise keep it around out of respect for its years of service to our family. The middle one is just right: the blade is recurved just enough to be useful and thick enough not to waver. The handle fits my hand. The weight and balance are just right. It’s like fitting a sword, but more practical these days. So my general advice is to try various examples of the necessary tools and trust your own assessment of their fitness for you. Add some butter to that pan on the stove so that it will melt while the bacon is cut to small pieces. Yep, we are going to cook bacon in butter on low heat. A “French cook knife” is most satisfactory for this bacon-cutting, as the cutting edge is convex. You can rock it back and forth, with one hand on the handle and the other flat on the back of the blade. But that is only when you are not holding a camera at the same time. There, I’ve just used the back of the knife blade to shove the bacon off into the pan. The bits will separate when stirred around. At no time do we make bacon “crisp” in this kitchen. When in your own kitchen, do just as you like, but for authentic Kelsay Carrots keep the bacon cooked, but soft. Cut up some onion next. You need one of those thin-bladed Oriental slicing knives with a straight cutting edge. A knife like this can slice beef so thin as to be translucent. We can achieve thin slices of onion which will cook through quickly and curl nicely around the carrot chunks. Do you have an in-law who tells you that you must cut up an onion along some x-axis, then some y-axis, then some z-axis, in that order? My sympathies. Pay no attention. It’s your onion. Boldly take up your French cook knife and cut up the carrots however you darn please. Now attend: when you have added them to the pot and stirred things around, you may not then leave. To soften these carrots, you need liquid. A little water, a little white wine, or a little broth will do the trick in just a few minutes. Today I have some pork broth handy, so I add enough to cover the carrots halfway, no more. We are not doing soup here. Put the lid on to fit tightly. Search around for the final ingredient: either sour cream, crème fraîche, or cream. Now learn this the easy way: crème fraîche is resistant to curdling under heat; cream and sour cream comparatively susceptible. For any of them, a minute or two to heat through is all that is needed. If you are using cream or sour cream, wait for the last minute to make the addition. Now, when is the last minute? The last minute is when the carrots are just soft enough to be nice; you might say al dente. Stand facing the stove, lift off the lid, and stick a fork into a carrot. We need fear no Banshee Beep of Cardiac Arrest to tell us when to proceed to the final addition. The plain nature of cold sliced roast beef complements the complexity of Kelsay Carrots at supper. A green vegetable laced with herb vinegar will complement the color and the richness of these carrots. Enjoy the contrasts. Bon appétit! Smacznego! Don’t put your knives in the dishwasher. Peking duck (北京烤鸭) is a classic mainstay of Chinese cuisine. It is often a special treat on the menu of Chinese restaurants, requiring diners to order in advance for serving to multiple people. There’s a reason for this: it’s a major production to prepare and serve. The classic recipe takes three days: the first to remove the neck bones and knot the neck, paint the skin with honey and soy sauce, and hang to dry; the second to blow up the skin like a balloon to separate from the meat then blanch in boiling water; and the third to roast the whole duck in a wood-fired oven. As I recall, I’ve only had properly prepared Peking Duck once in my life, when a bunch of programmers at the place I worked in the 1970s arranged a Chinese banquet at a restaurant in Berkeley, California, but long before and after that I’ve made this recipe or variants, which I find excellent, if not authentic, and a tiny fraction of the work. You can look at this as a special treat, but making it couldn’t be easier. This week we bring the spicy heat of the Caribbean to this cold and dark northern hemisphere winter with this Fourmilab culinary creation: Jamaican jerk seasoned boneless Cornish game hens with jerk, lime, and coriander seasoned rice. This is a medium-hot recipe (I’ve had much hotter in Indian restaurants), but you can adjust the heat to your own compression ratio simply by adding more or less jerk seasoning to the rice (the seasoning of the meat doesn’t make much difference in the overall heat). I make this recipe using an Actifry, but if you don’t have one, I’ll provide instructions for cooking in a conventional oven. What can be written about seaweed wrapped Spam that hasn’t been written? I will let the pictures speak for themselves. Bentos are Japanese lunches in a multi partitioned tray. In old days it was a wooden box. Now it is usually styrofoam or plastic. The common factor in all bentos is rice. This takes up the most space. After that you can have fish, beef, chicken, or fried varieties of the former. There are various side things that come with it. This can be vegetables, potato salad, Japanese pickles, etc. 7-Eleven sells a lot of bentos here. There is a custom to buy a deluxe bento at the Bullet Train Stations to eat on the Bullet train. These usually have local delicacies in them. There is also a type of fast food shop that sells bentos with hot rice. There are homemade bentos too. Housewives get up early and make bentos for the family. These are put in plastic boxes. The ones for children have cartoon characters on them. Some have a lower a lower section for rice with an upper section for the side dishes. Others just have a divider to separate the rice. To see some of the varieties please look at this page. Have any of you had bentos? If so what kinds? Strange is in the eye of the beholder. At one time I thought raw fish, squid and octopus was strange now I think it is normal. Eel is quite delicious over rice in a nice sauce. All cultures have their hard to eat foods. Natto, fermented soy beans that have strings like cheese when you eat it, is the one in Japan. I’ll put up a video later. What food will put hair on you chest or take it off it that be the case? What is the strangest thing you have eaten? I remember asking a Japanese about American food. Raw broccoli was hard for him because cooked broccoli is the norm here. I don’t remember all the options for storing food as there is today. For the most part it was plastic wrap and Tupperware. Now there is a plethora of options. Take plastic bags. In the old days you you had plastic bags with a paper covered wire to twist the bag shut. Now there are resealable ones. The old ziplock bags with one line has been replaced with two lines to close the bag. There is even a zipper type closer. There are normal storage and freezer bags. Does the food know which bag it is in? Now there are many Tupperware knockoffs. Some come with lids with a dial for the month and day. Others have valves that let out the air in the container so it stays fresher longer. Or there is the refrigerator with a compartment where no wrap is needed. I am not sure how that works. So how do you store your food? It is the time of year where the world is filled with orange and black decorations. Halloween is 9 days away. What are the tradition Halloween foods? I can think of two. One can’t forget Candy Corn. The above picture is of green tea. It is something I drink but rarely make for myself. My preferred drink is black tea with milk. Occasionally this without the whipping cream. What is your go to hot liquid? Are there any unusual things you like? I grew up on cereal, toast, and pancakes for breakfast. There seemed to be specific things for breakfast. When I came to Japan I was surprised that something like these were breakfast food. For the purpose of this post I would like to discuss time eating. I put up a chart of how much time people spend eating per day. North America seems to be world leaders in speed. I wonder why that is. Why are other countries slower? For Japan, I think some of the factors are probably the following. The food is piping hot so you wait for it to cool. It is hard to eat super quick with chopsticks. There is a lot of veggies so more volume. Also it is rude to eat too quickly. This hopefully will be a discussion thread. Excepting for bread, I don’t think there is another food is so manipulated as pasta. Even though it can come from the same ingredients, I believe the taste is different. That doesn’t make sense but it is true because the shape determines the amount of sauce in the bite. Do any of you make your own pasta? If so what kind? 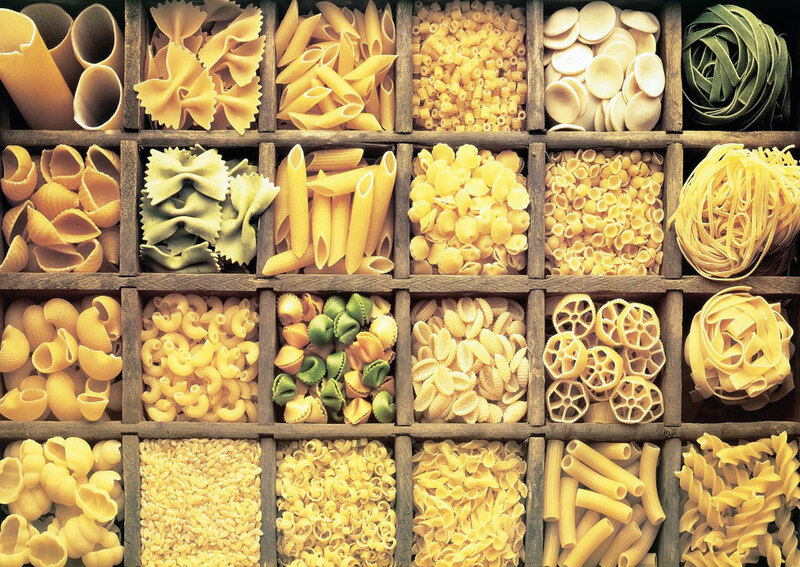 What is your favorite shape of pasta? What is the most unusual shape that you have cooked? What is your go to sauce? UPDATE:Can anyone name all the pasta shapes in the picture on this post? A classic dish in Szechuan Chinese restaurants is Twice Cooked Pork, a spicy stir-fry with pork and crunchy vegetables that combines interesting favours and textures with enough heat to wake up your taste buds (and, depending on the restaurant, make your eyes water). There are several styles of this dish, and the traditional way of preparing it is somewhat time-consuming and fussy. If you’ve read my other recipes, you know that’s not for us. Here is a variant where the “first cooking” is done when you make our Chinese Roast Pork and the leftover meat from that dish is the starting point for this one. If you consider this inauthentic, that’s because it is! If you like, call it “Twice Crooked Pork”! It’s still delicious, quick and easy to fix, and can’t fail.